CarGurus has 1,563 nationwide Prius c listings starting at $3,900. Need a subcompact hybrid hatchback with surprising room, a truly affordable MSRP, and a healthy dose of standard features? Check out the 2016 Toyota Prius c. It may not be the quickest off the line--in fact it’s among the slowest--but it’ll get you to work and back, or your family to the mall and beyond, and burn very little gas while doing so. And if you opt for the brand new Persona Series trim, you'll even turn a few heads. 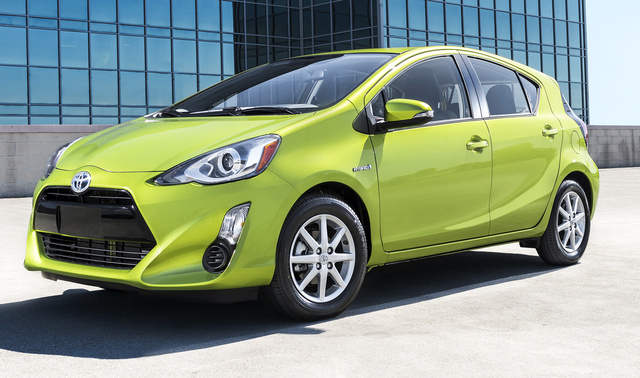 The 2016 Prius c returns in the base One trim, the Two, the Three, and the flagship Four. The new Persona Series, which is based on the Prius c Two iteration, comes with an all-black exterior (including the wheels), distinctive badges, and neon splashes of either “electric lime” or “cherry pearl” on the mirrors, below the windows, and beneath the headlights. All Prius c trims are available only with front-wheel drive (FWD). Toyota lists cargo area at 17.1 cubic feet behind the second-row seats, but does not mention total cargo area, perhaps because the base One offers a folding bench rear seat, different from the split-folding rear seatbacks on all other trims. The 2016 Prius c packs a 1.5-liter inline 4-cylinder (I4) hybrid engine and a 525-volt electric motor managed by a continuously variable transmission (CVT), putting out a total of 99 hp and 125 lb-ft of torque. The CVT boasts a selectable EV mode that allows the Prius c to be driven up to a mile on its nickel-metal hydride battery alone, and an Eco mode that adjusts throttle response and climate control functions in order to optimize fuel mileage. Mileage numbers come in at 53 mpg city/46 highway/50 combined, which reviewers say are at the top of the Prius c's (somewhat limited) segment. Look for the 2016 Prius c One to sport standard 15-inch steel wheels, LED headlights, taillights, and brake lights, cloth upholstery, a folding rear bench seat, full power accessories, a multifunction display, and telescoping tilt-wheel steering. This entry-level trim also features automatic climate control, Bluetooth hands-free calling, a 6.1-inch infotainment display, and a CD/MP3 player with 4 speakers and a USB port. The 2016 Prius c Two, Three, and Four add such standard features as alloy wheels, cruise control, upgraded upholstery, a heated power-adjustable driver’s seat, split-folding rear seatbacks, a 6-speaker audio system, satellite radio, voice-activated navigation, and smartphone apps. The Prius c Four trim also throws in a standard power sunroof, heated outside mirrors, a rear-view camera, and heated front seats. The Persona Series includes the standard features found on the Two. Standard safety features aboard the 2016 Prius c include 4-wheel antilock brakes, traction and stability control, hill-start assist, front-side-mounted airbags, front- and rear-head-curtain airbags, front-seat-cushion airbags (to prevent passengers sliding under the seatbelts in a collision), and a driver’s-side knee airbag. Daytime running lights are standard in all trims, and the Prius c Four adds standard daytime running lights. The above-noted new Safety Sense C package (available as a standalone option in the Prius c Four and as part of option packages on the lower trims) includes low-speed pre-collision braking, lane-departure alert, and automatic high/low-beam headlights. The National Highway Transportation Safety Administration (NHTSA) gives the 2015 Prius c 4 out of 5 stars for overall crashworthiness, while the Insurance Institute for Highway Safety (IIHS) awards the hybrid hatchback a score of Good in all tests other than the small-overlap frontal-offset portion, where it gets a worst possible score of Poor. Now that Honda has deleted its Civic hybrid, the CR-V hybrid crossover is about the only 5-door hybrid to rival the 2016 Toyota 2016 Prius c for affordability. What's your take on the 2016 Toyota Prius c? pcrane21 I just purchased a 2016 Toyota Prius c in Canada and they can not even get entune their "revolutionary "system to work here. basically we get a radio and maps. Toyota can not keep up with what people want. Have you driven a 2016 Toyota Prius c? Has Anyone Had The Glove Compartment Jam Open? I can open the glove compartment but when I close it, it feels like something is keeping the door from closing completely. I can get it to close if I PUSH really hard.